No matter how many times I try to change up my breakfast routine, I just can’t do it. I am a cereal girl at heart. So I always get a slight pang of food guilt when I read yet another article about how nutritionally deficient breakfast cereals are. But then I remind myself that not all breakfast cereals are created equal. 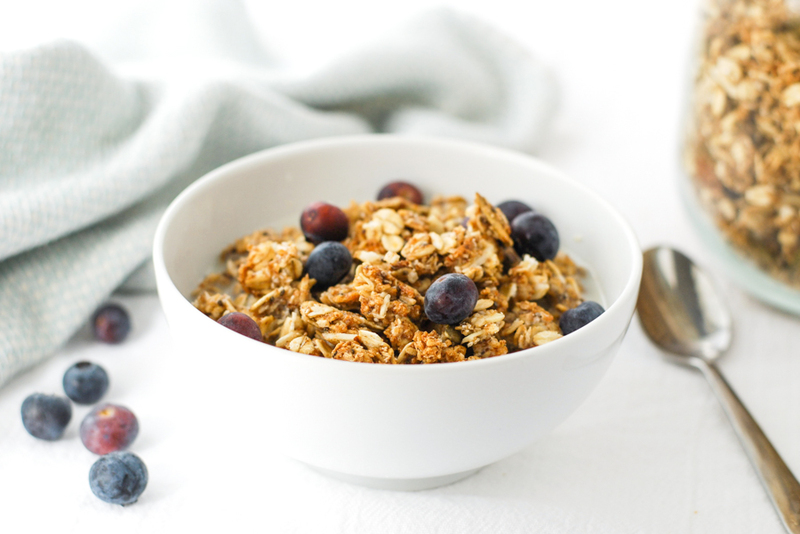 It is entirely possible to make sure your cereal is a nutritious, protein-packed breakfast. And this almond butter crunch granola is an excellent example of how to do that. 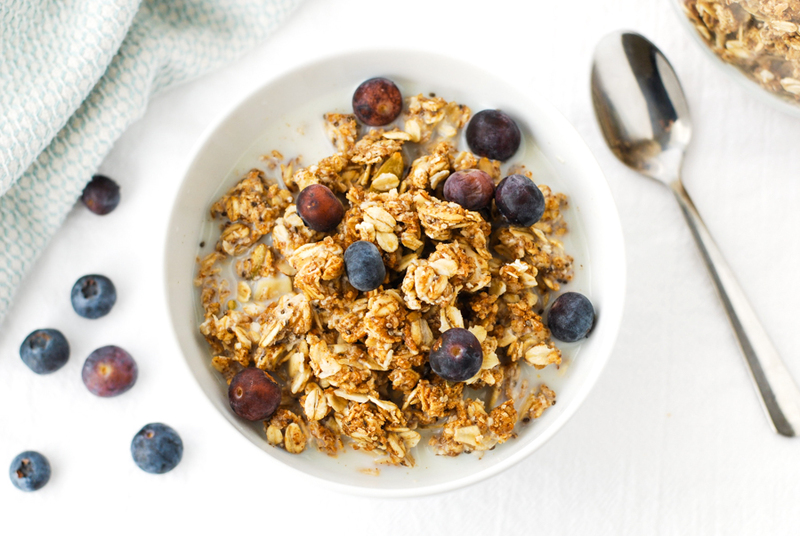 The problem with many breakfast cereals is that they are made from processed grains (carbohydrates) with added sugars (more carbohydrates). Even if you sprinkle a few berries on top for added nutrition, you are simply adding more carbohydrates to an already carb-heavy meal. To create a balanced breakfast that keeps you feeling full and stimulates maximal protein synthesis, you really need a good amount of protein. Ideally, you want at least 20 grams per meal. 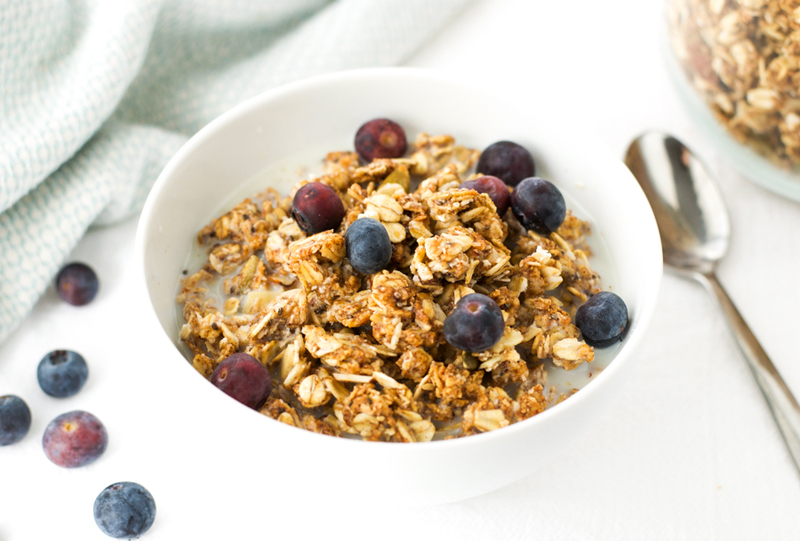 So how can a cereal-loving gal get 20 grams of protein at breakfast time? Read on to find out how. 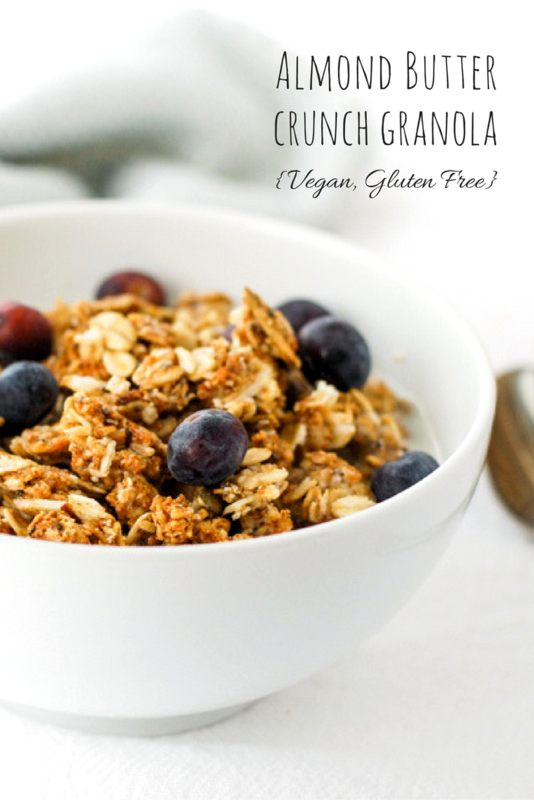 This vegan and gluten free almond butter crunch granola has 8 grams of protein per half cup. If you add that to 1/2 cup Greek yogurt or Icelandic Skyr yogurt, that will add up to around 20 grams of protein. Throw some berries or chopped fruit on top for extra nutrients, and you have a wonderful, protein-packed, fiber-filled breakfast. Then, the next time someone tries to shame you for eating cereal for breakfast, you can tell them with confidence that your granola and yogurt breakfasts have more protein than 3 eggs! Preheat oven to 300F and line a baking tray with parchment paper. In a large bowl, stir together the oats, coconut, almonds, pumpkin seeds, flax seed, chia seeds, and cinnamon. Set aside. Put the almond butter and maple syrup into a saucepan and place it over a medium heat. Stir until melted and well combined (about 2 minutes). Pour the almond butter mixture into the dry ingredients and stir until all the oats are well coated. Spread the mixture on the prepared baking tray, press down, and put it in the oven for 30 minutes, or until golden brown. Remove from the oven and let the granola cool on the baking tray. 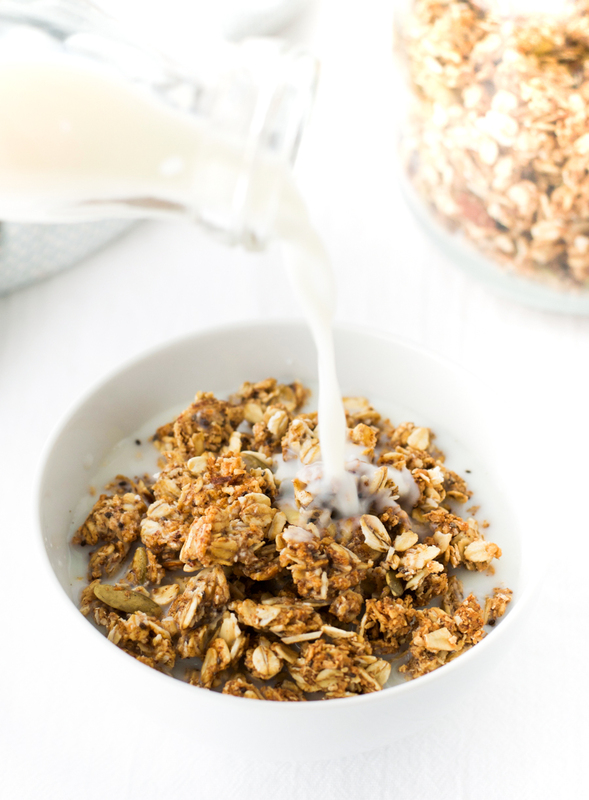 Once completely cool, gently break up the granola into clusters and store in a jar or tupperware for up to 2 weeks. I like this crunchy and convenient breakfast! Most importantly, it is healthy! 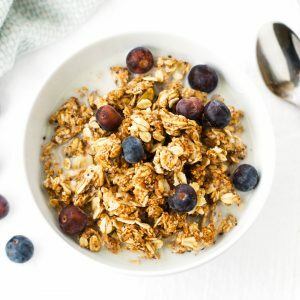 My favourite granola recipe of all time! Only a small amount of maple syrup and no sugar. Hooray! Try finding a granola in the supermarket that has no sugar in and doesn’t taste like cardboard or a hard bird seed. This is a wonderful alternative and super easy to make. Thanks Esther!